To celebrate our wedding anniversary (15 years! ), Sailor and I decided to go out for dinner. We picked a restaurant that is close to home, and the food is good. And as a nice little bonus, I knew I had a gift card for the restaurant. Turns out, I had 3. I keep all of our gift cards in a drawer of my Grandmothers’ mahogany dresser. 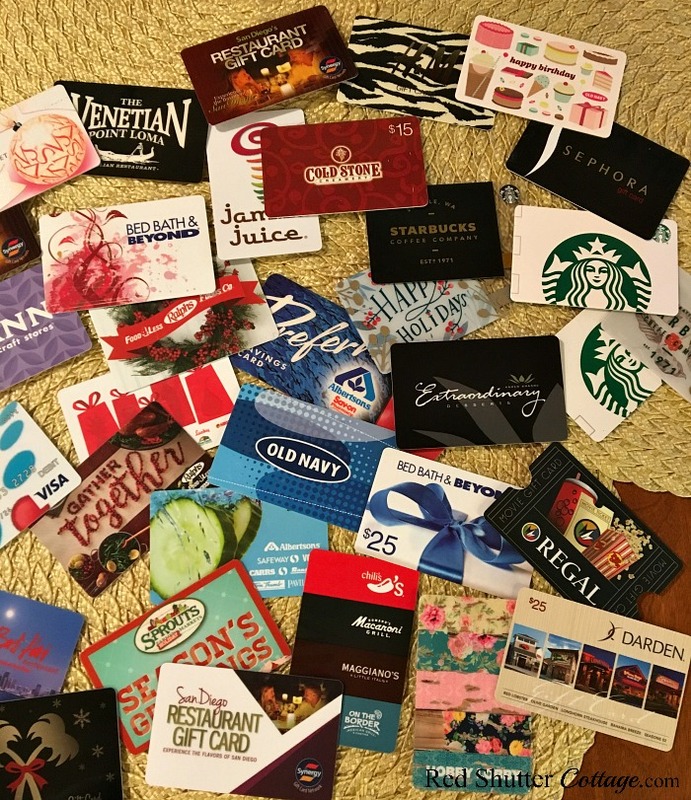 We received a few gift cards for Christmas, and I had tossed them into the ‘gift card drawer’, not really looking at what I was already there. 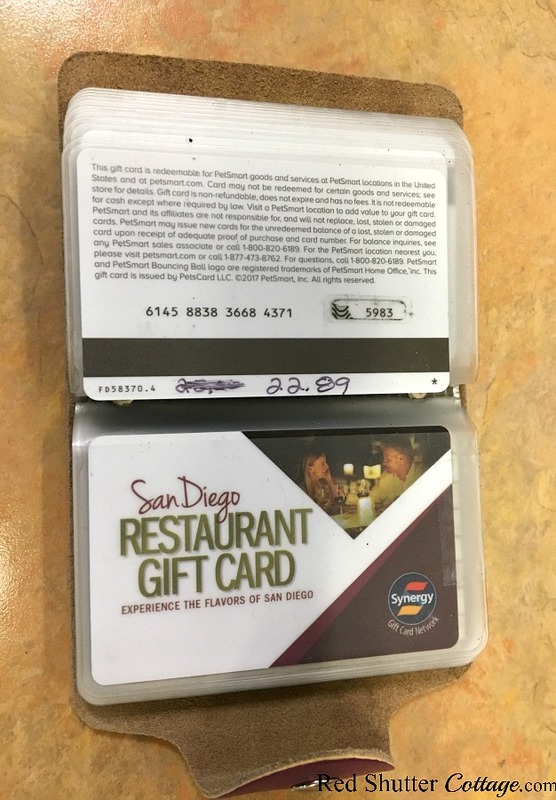 So when I went to search for the restaurant gift card, I was floored by the amount of gift cards I found, including 3 for this same restaurant! I had quite literally forgotten about many of the gift cards in the drawer. Sephora, Bed Bath & Beyond, a delicious Polynesian restaurant, JoAnn’s, Coldstone Ice Cream, In-n-Out Burger, Jamba Juice. Oh, and Starbucks… MANY Starbucks! And then I glanced at the dollar amounts on them. I am not that good at mental math, but it was clear to me that the total amount came to almost $800. The thought hit me right then and there; I was letting a pile of money sit in a drawer in our bedroom. I immediately realized what my problem was. I am big on visibility; I need to see things easily to keep track of then. 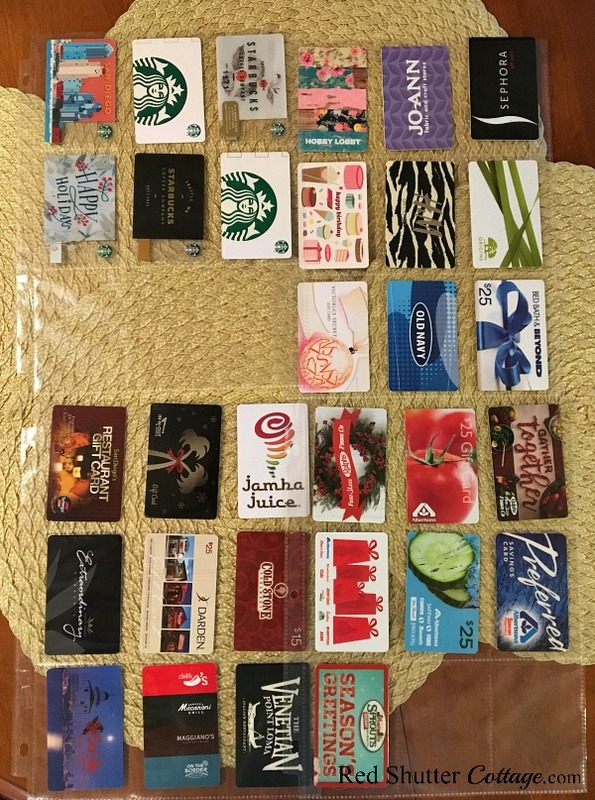 This pile of gift cards was hidden in a drawer. Hidden in a jumbled mass that I would paw through periodically, and then ignore. 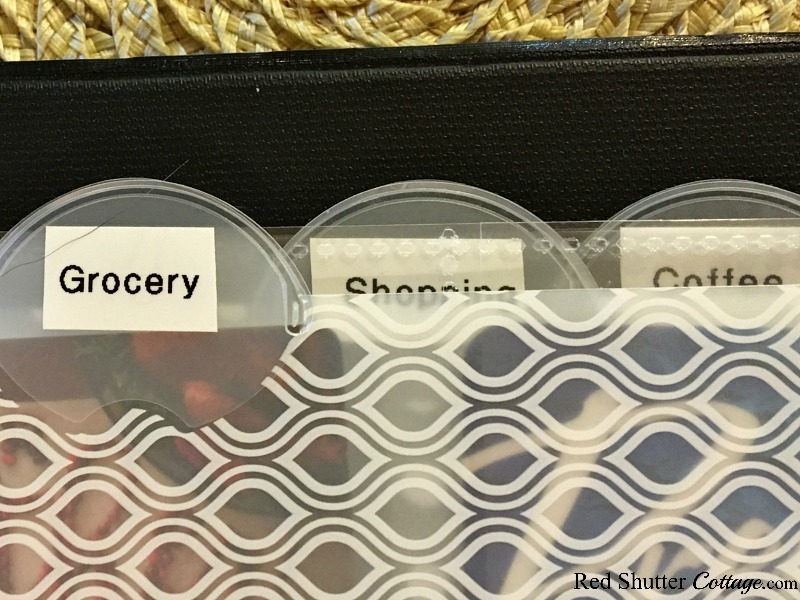 In terms of organizing solutions, this one was pretty easy. Really. 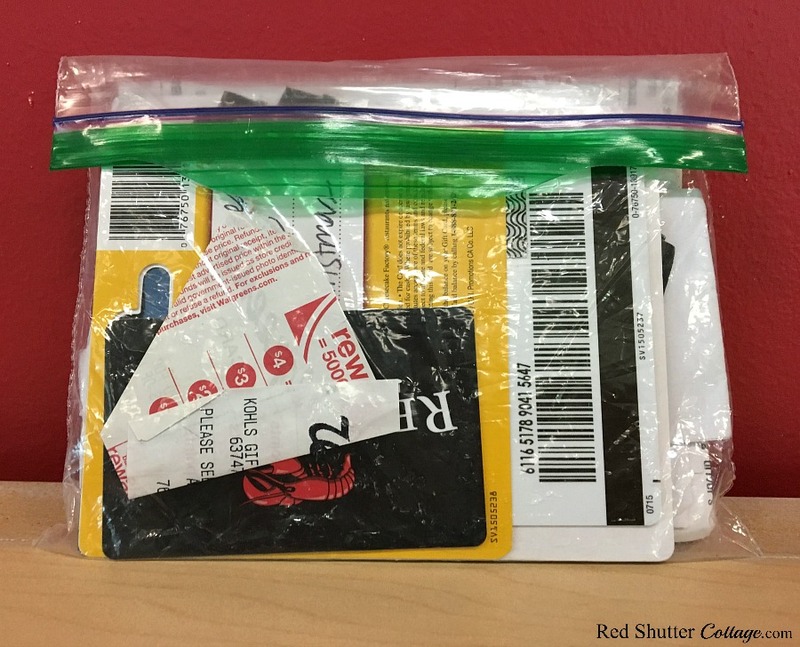 A gift card is actually the same size as a credit card, a business card, and many coupons that are in the Sunday newspaper circulars. 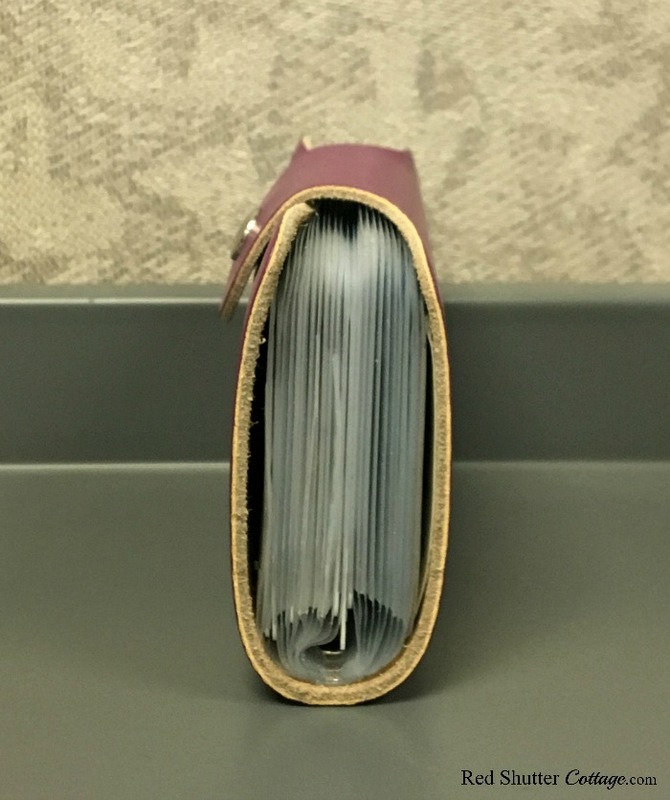 I have a coupon binder, and I use baseball card protectors to hold the coupons. So I immediately envisoned a baseball card protector sheet filled with the gift cards. 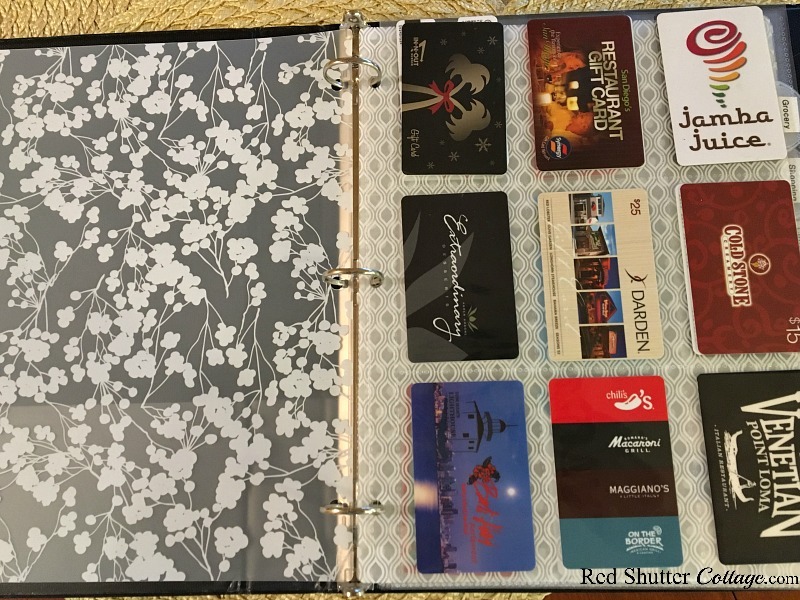 I could even use dividers and break out the gift cards into different categories: shopping, restaurants, grocery stores and…coffee! 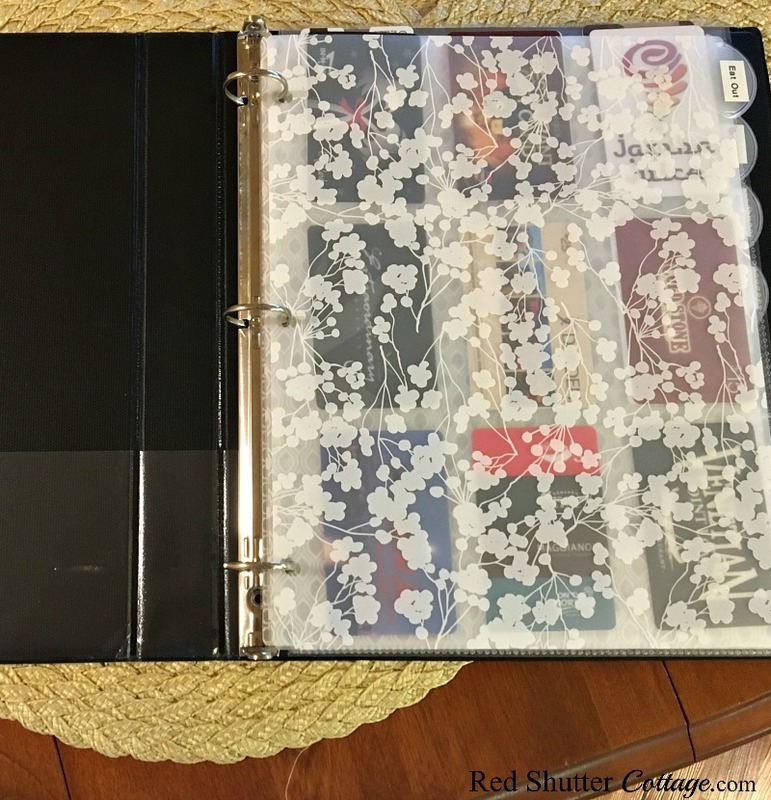 I picked out a binder I was not using (I love binders – and use them for EVERYTHING), and added some baseball card protectors. 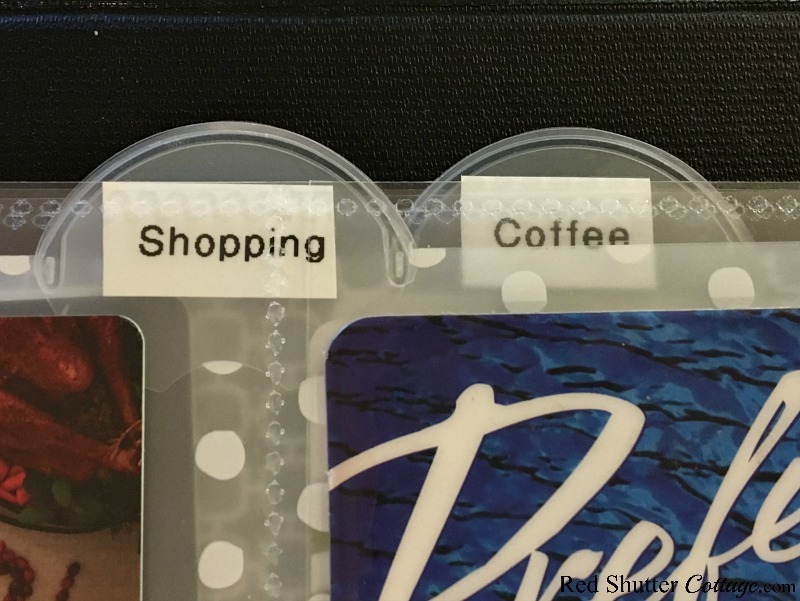 I had some 3-ring dividers I wasn’t using, and recruited them to bring some order into the binder. The end result is perhaps not glamorous or Instagram-worthy, but it’s a nearly 1000% improvement over what was. 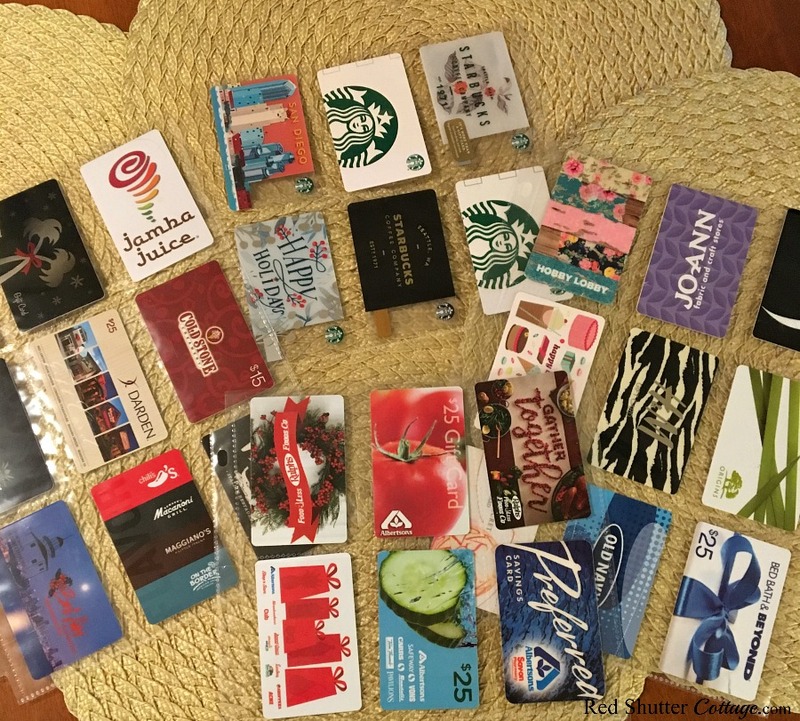 I did an informal little poll of how my friends and co-workers organize their gift cards. Of course, I had to start with one of the most organized people I know, my co-worker Diane. Diane has not 1, not 2, but 3 organizational systems for her gift cards. 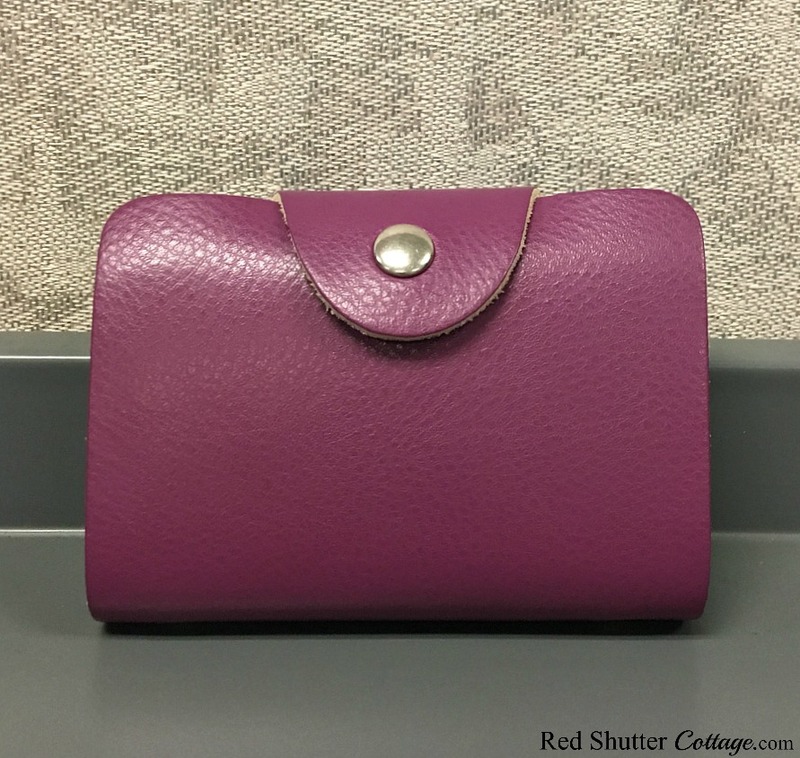 In her purse, she carries gift cards she know she will want and need to use when she is out and about shopping. She keeps them in a little credit card wallet in her purse. Here is a link to a similar one on Amazon. And then at home, she keeps other gift cards in a business card book. And on top of all that, she keeps track of them on a spreadsheet. She told me the last time she totaled her gift cards, it was over $1,100. Now I feel like a rookie! My friend Teri has a different approach. She keep keeps them in a plastic bag (excellent visibility!) and carries them in her purse. 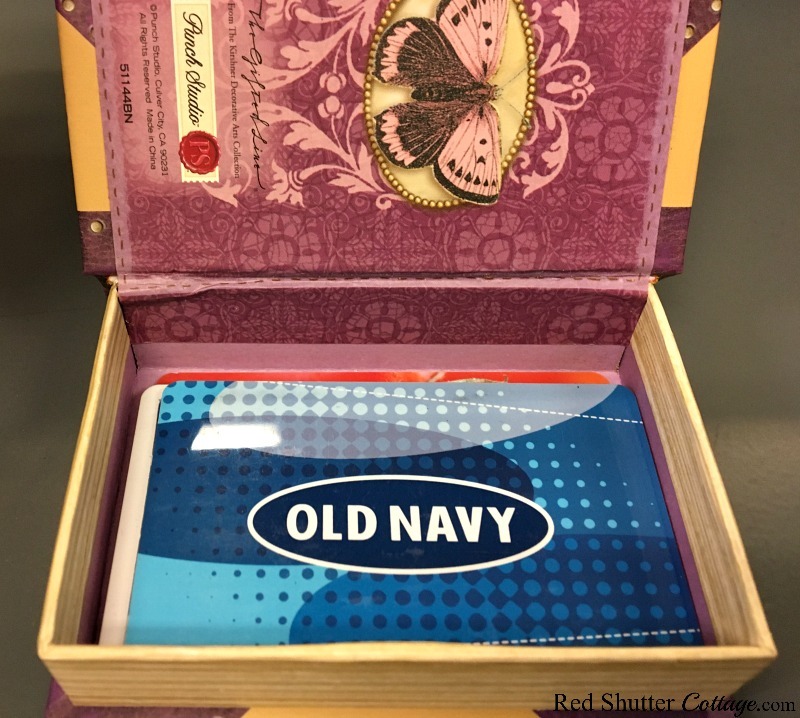 Recently her husband wanted to buy ramekins at Kohls, and asked if she had any Kohls gift cards. She reached into her bag and pulled one out. (With strict instructions to bring back the receipt so she could track the balance!) If they are out shopping, and want to go somewhere for lunch, a Red Lobster gift card gets put into service. My friend Debbie was doing a little decluttering at home, and came across one of those charming boxes they sell at Home Goods. They are made of super sturdy cardboard with beautiful design on both the outside and inside. There is a little magnet system that keeps the lid of the box closed snugly. 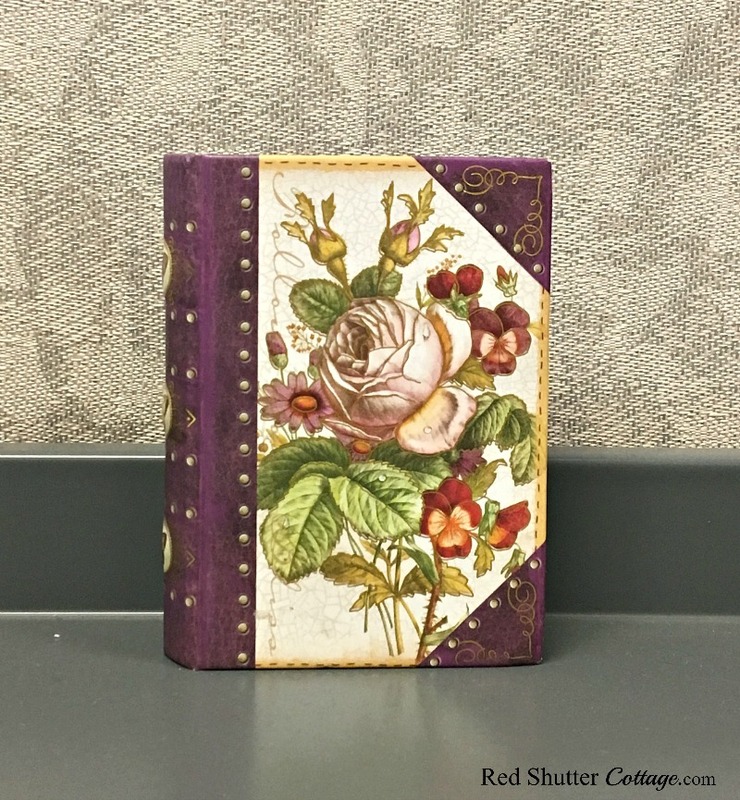 It’s about the size of a deck of cards, and when she found it, she immediately realized its value as a gift card holder. This is pretty and functional at its finest! All 4 of these ideas speak to my feeling that organization is an extremely personal. 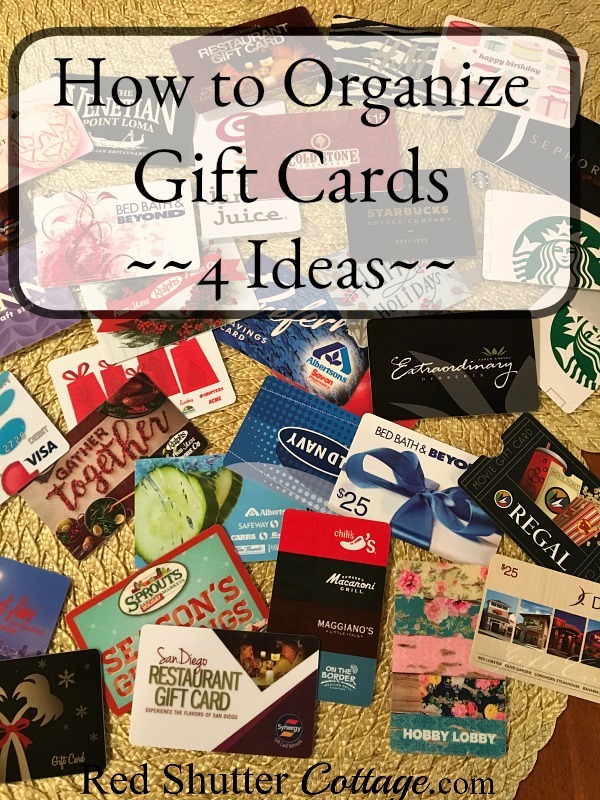 There is no right or wrong way to organize gift cards, or anything else for that matter. There is only the way that works for you! We all like different foods, different music, different movies, etc. Organizational style is no different. I have mentioned the “Clutterbug” blog before in this post, and I will mention it here again. She is the only ‘organizing guru’ I have ever come across that addresses this. Her blog covers 4 different organizational personalities, and then offers specific ideas and inspiration for each individual style. 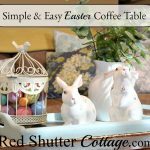 Take the test on her blog – it’s fun ! The tagline of my blog is ‘Beauty. Order. Contentment’. This post speaks to “order” and consequently, contentment. I feel strongly that order leads to contentment, or at least creates the opportunity for contentment. On the scale of things, organizing your gift cards is doesn’t exactly rank with an organized pantry. On the other hand, with over $300 in restaurant gift cards, you can bet Sailor and I will be going out to dinner a lot more! And there is certainly some kind of contentment in that. By the way, our anniversary dinner was delicious, and we only used 2 of the 3 gift cards! Fabulous ideas! One moe question.. where do you GET all these cards? I just checked my stash…I have 5. P.S. 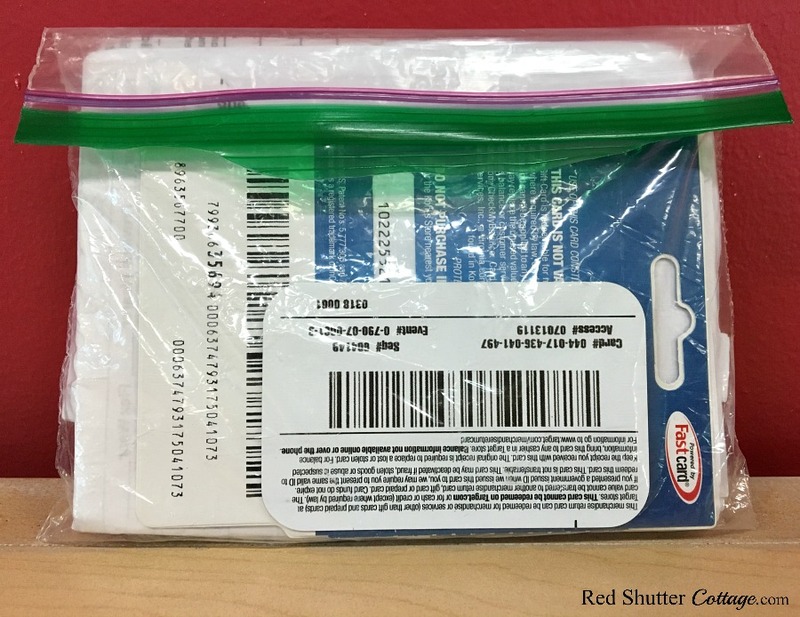 I love the baseball card holder idea for storing thumb drives with a slip of paper identifying their file content. I use this at work (stored in a safe and encrypted) and just realized I could use at home for photo backups, etc. The reason I have so many, is because I never use them… and they just collect in the drawer! What a smart idea to use the baseball card holder for thumb drives and also for photo back-ups! Thank you for sharing that !! I’m with Teri. Have them with me so if I stop in at a store I have the card. You know you can combine all of your Starbucks cards into one online? Register the cards and transfer the balances to one card. Spend those cards! They don’t do any good in the drawer or in the binder! Have fun and Happy Anniversary! The two of you are a little more on top of it than I am!! And I DID NOT KNOW you could combine card amounts on-line into just one card – brilliant! I did try to use one of the Starbucks card recently, only there was a big sign saying their card reader was not working – Cash Only! I turned around and walked out. If I can’t have it for free, well then forget it ! I probably do need help spending them – thanks for the offer! You will be proud to know that I DID use the Hobby Lobby card yesterday – nearly a year after it was given to me! 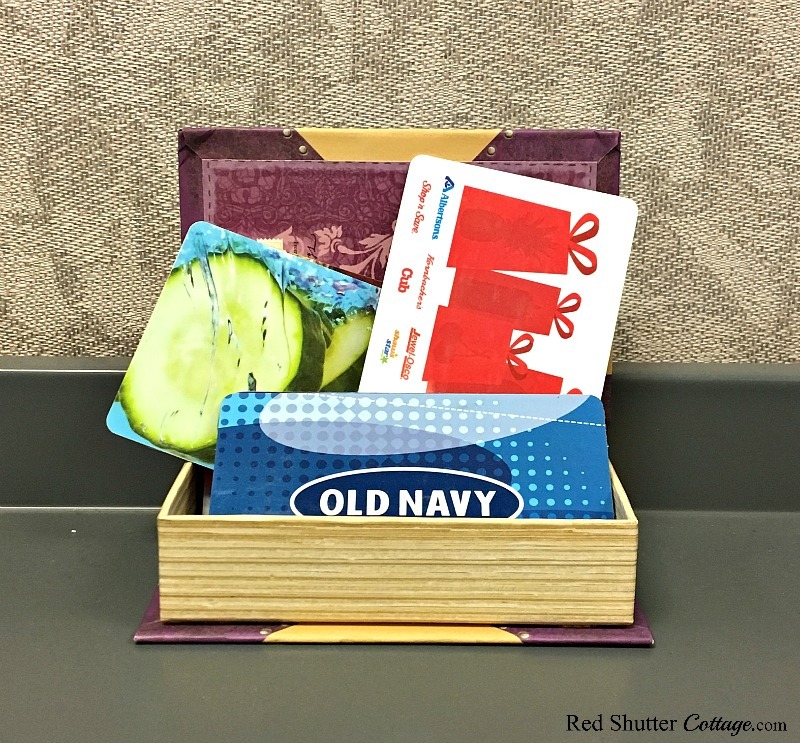 Some people do have the talent to put gift cards in a box, remember where they are, and what cards are inside! Clearly you and I need quick and easy visual access! Thanks for making me laugh, Leanna! At least you share them with your family – that is so generous! It really is amazing how easy it is to forget we have them; the right ones can really lighten the financial load!